311km cycling event starting from Raynes Park. Controls at Lasham, Amesbury, Whitchurch and Bracknell, plus 3 information controls. Ride out to Wiltshire and back in a day! Start and arriv�e at a scout hall. Entry fee includes brekky and dinner. Fri & Sat overnight accommodation available (bring your own mat and sleeping bag please). 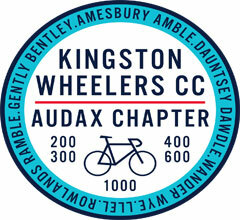 An easy-going, gently rolling course, mostly on quiet lanes - an ideal first 300. Enjoy a second brekky at Lasham Garden Centre; a fabulous bakery lunch in Amesbury; tea and cakes at the new Kudos Cafe in Whitchurch (staying open specially for us! ); and a late supper on a garage forecourt in Bracknell! What more could a randonneur possibly ask for?